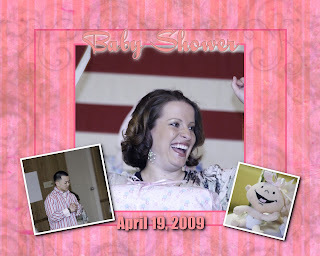 I had the honor of shooting the baby shower for Shannon and Ryan on April 19th. They are a great young couple and her enthusiasm and joy shows in this photo. The shower was held at the Baden American Legion and the flag behind her made a great backdrop for most of the pictures. In fact, I used the flag as a backdrop for a few quick portraits rather than the brown paneling walls. Why? 1. Because the flag added some color and class to the image. 2. The paneling is very reflective and any amount of light glares off the surface causing an ugly glare and hot spot. The main image was shot with the D300 @ ISO 1600, using the 70-200 @ 1/250th second with a fill flash. I used a bounce card on the flash which was pointed straight up to the ceiling. The flash filled the area and the card on the flash sent some light directly forward filling the area under her eyes and adding the twinkle.